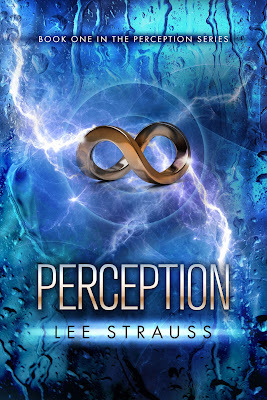 Ivy Book Bindings: Cover Reveal and Excerpt of Perception by Lee Strauss! Cover Reveal and Excerpt of Perception by Lee Strauss! Seventeen year old Zoe Vanderveen is a GAP—a genetically altered person. She lives in the security of a walled city on prime water-front property along side other equally beautiful people with extended life spans. Her brother Liam is missing. Noah Brody is a natural who lives on the outside. He leads protests against the GAPs and detests the widening chasm they’ve created between those who have and those who don’t. He doesn’t like girls like Zoe and he has good reason not to like her specifically. Zoe’s carefree life takes a traumatic turn. She’s in trouble and it turns out that Noah, the last guy on earth she should trust, is the only one who can help her. Perception is a Science Fiction, Mystery, and Romance Young Adult Novel that takes place in the not-too-distant future in a world changed by climate extremes, natural disasters and impending wars, and where scientific breakthroughs cause class divisions - both financially and philosophically. It explores the clash between faith and science and how differences can separate us as enemies or alliance us together. And in some cases, even in the midst of betrayal and personal crisis, there’s room to fall in love. Perception is the first book in a planned three book series. I stepped back agitated. I recognized the dark-haired boy wearing the white tunic my mother made the male staff wear. He was the maid’s son. He held a wet mop in his hand, and I figured he’d been cleaning up Liam’s spotty water trail. What do you think? I'm quite intrigued by this story already and think the class differences between Noah and Zoe make for an interesting relationship. Plus, aren't you just dying to know about what Liam is working on and where he went? If you're interested in this novel, be sure to add it on GoodReads here and check out Lee Strauss' Website, Facebook Page, and GoodReads for more information about her upcoming novel! I've never heard of this book before but love the blue theme of the cover, the infinity symbol and the lightning effect! Zoe and Noah both sound AMAZING and the excerpt is AWESOME too! I adore books about science-fiction, particularly when there's romance too ;) I will definitely have to check this one out too! I've been hearing a lot about this book lately. Thanks for sharing an extract from it! It definitely sounds like a pretty cool book already! The cover is a pretty blue! "Plus, I love the type of romance that starts out as hatred and progresses into something much deeper." ME TOO KEERTANA! That type of relationship is one of my favorites EVER, I just can't get enough of the antagonism. I think I definitely need to give this book a try, SciFi is hit or miss with me usually, but I have high hopes for this one after that blurb and excerpt! Oooooh, sounds really interesting! Never seen this one before, but I think I'll check it out further. Thanks for sharing the excerpt! This cover is really very nice. And I totally agree with you and Jenny on romances that start off as hatred - great post! Oh wow. That cover. That synopsis. And the writing. This one is definitely a must have. I'm going to go add it to my tbr right now. Sounds right up my alley. This does sound good, the blue of the cover is pretty & stands out a lot! Pretty cover! I really like the hate turned to love romance too, it provides tension & change. Yay for sci fi!